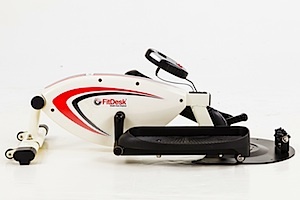 The FitDesk Company is well known for their best seller The FitDesk® v2.0 Desk Exercise Bike. Today they have a brand new under desk elliptical. This is great news because quality made pedal exercisers and ellipticals are needed in the office to help keep us fit. ⇰ The FitDesk Under Desk Elliptical is low profile so most people can use it comfortably under their desks and not have to worry about crowding out their keyboard drawer or hitting their knees. 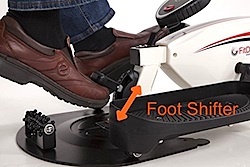 The wheels under the pedals ensure a smooth and quiet gliding feel. This way your work isn’t interrupted with jerky movement or unwelcome noise. The low impact nature of the larger elliptical machines has been adapted to this smaller more compact elliptical. 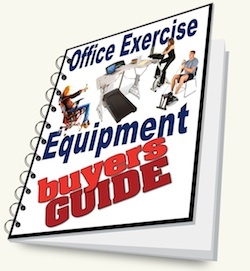 With this under your desk you can experience a smooth and light exercise program every day to help you reach your fitness goals. Having this FitDesk elliptical isn’t just about weight loss goals either. You may have heard about Sitting Disease but do you know how bad it really is? This little machine can help with that. Check with your medical professional. Most likely they will encourage such a purchase. This elliptical was strictly designed for under the desk use. Unlike some of the others that can be used standing or sitting making them a little to high to use in some cases. You don’t need to be an engineer to know that a machine will get all wobbly when in motion if not made right. This one has included a heavy flywheel to ensure that you can up the resistance settings for a good workout and still have a smooth low-impact experience. 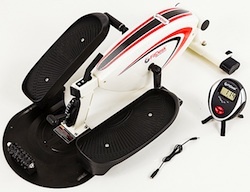 Unlike the other pieces under desk exercise equipment, the FitDesk elliptical has a unique accessory that you don’t find on any of the others. It has the ability to increase and decrease the resistance of your workout using your foot. This way you don’t have to stop, push your chair back, crawl under the desk, and turn a knob. 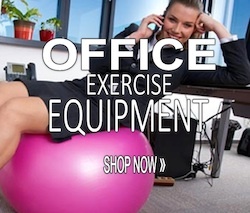 This new to market under the desk elliptical has taken office fitness to the next level. This mini elliptical has been built for purpose! Assembly is simple. Just a few little parts to put together a you are off to the races. As an added bonus the display can sit on your desk or your elliptical. When attached to the equipment it is closer to the back so you can easily see it from your seated position. It also comes with a cord attachment so you can simply slide off the display meter and place it on your desk using the handy little stand that comes with it. Because it keeps track of your performance you can really set some fitness goals without leaving your cubical. 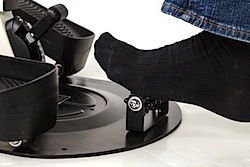 Use the foot lever to add resistance while you experience a nice, smooth, and comfortable movement. Put that high velocity flywheel to the test. Imagine the fun you and your workmate can have competing with one another by setting different goals and keeping track using the included display. There are 8 different resistance settings to give you a full range to choose from. Everything from just being able to move your feet around with hardly any resistance – to all the way to really having to work at it! The manufacturer has stated that a person can burn up to 300 calories an hour using this new FitDesk Under Desk Elliptical. Quality made as expected from the people at FitDesk with quiet and smooth motion design, precision gearbox, and heavy high velocity flywheel. Another added feature is a little foot massage bar. Great for aching and tired feet. The weight of this machine is more than the desk pedal exercisers at 31 pounds. The good news is heavier means it won’t be easy to slip and slid away. Because it is new there aren’t a lot of independent buyers just yet to hear from, but the good news is, you can “buy it and try it”. Check the terms where you buy FitDesk Elliptical but most places will let you return it if it wasn’t what you wanted. Will the Desk Elliptical assist with weight loss if used daily ?? How does this compare against the Stamina? I read both reviews and it looks like the only difference is the Stamina lets you stand or sit while using it. 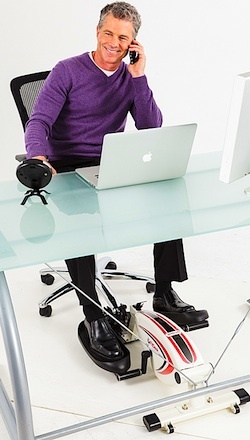 The FitDesk Elliptical is probably better suited for using under a desk. Another one is the Cubii under desk elliptical.